Thanks! He really loved it! People even commented on how lovely it was. I really recommend them! I suffer with back aches quite a bit and you honestly cant feel you're carrying baby!! Oh fantastic how cute is Jack, he looks so excited!! 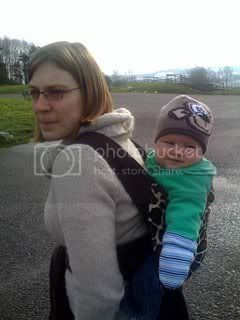 aww how cute ,he looks so happy ....i havnt ever heard of these slings though ...have i been living in the dark ages?? Yes Lisa you have!! Come on out Mrs Flintsone! Only just seen this cos I've been away, but I'm sooooooooo pleased that you like it!! He looks so happy Kerry! Bless him! Will definatly recommend that everyone now emails Kerry asking for a Mei Tai sling!! No other ones compare! !